Our entire lives come down to the decisions we make. I’m no Sigmund Bloom when it comes to intertwining life’s philosophy with fantasy football, but I can simplify it to this — every choice we make in a fantasy draft has a subsequent effect not only on our own teams drafted, but those that our competitors can field as well. Taking the last of a player in a tier can help you maximize value while hurting your opponent’s chances of winning if they make a “reach” and grab someone from the next tier a bit too early. This article will take a look at several players that have similar average draft positions with the aim of pointing you in the right direction for whenever you’re on the clock. Let’s get right to it. 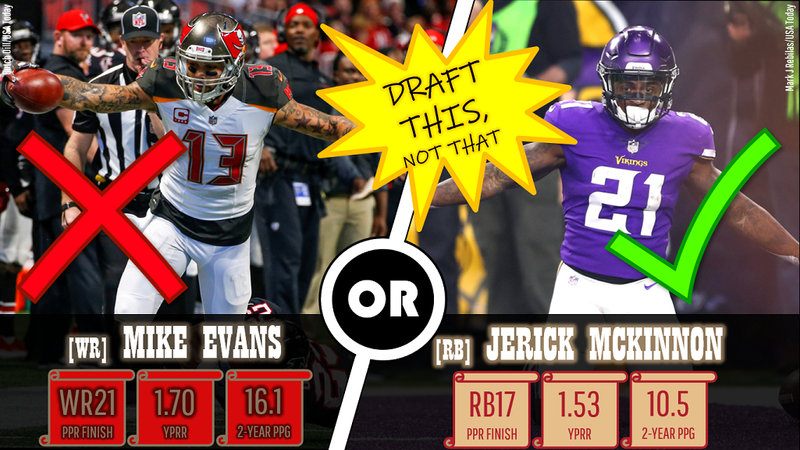 Both players currently have an average draft position that puts them at the Round 2-3 turn, but whenever McKinnon’s name is still available, he should be your go-to draft decision. The 49ers invested quite a bit into McKinnon this year and decided to double-down on him by foregoing any additional help in this year’s draft. McKinnon’s four-year, $36 million contract is really designed to be just a one-year deal the 49ers can get out rather easily, but the bottom line is they’re paying him $11.7 million guaranteed this season. By all intents, this is going to be the McKinnon show in San Francisco for as long as he remains healthy. That can be a potentially dangerous thing given how well the offense clicked when Jimmy Garoppolo entered the offense late last season and routinely got their team in scoring position. With offensive wunderkind Kyle Shanahan calling the shots, McKinnon has a chance of securing one of the few, coveted bell-cow roles. Evans on the other hand, has a litany of issues that make his WR9 status a fade. Let’s start with his quarterback, Jameis Winston, who has now been suspended by the league for the first three games of the season. Evans will now be catching passes for the first three games from 36-year-old Ryan Fitzpatrick. In backup duty last year, Fitzpatrick threw below his career completion percentage for the third consecutive year as he enters the twilight of his career. When Winston returns to the lineup, he’ll find that he won’t need to force the ball to Evans like he has in the past. The Buccaneers have spent significant draft capital to compile a field full of playmakers at Winston’s disposal for when he returns. Evans won’t come close to sniffing his 175 targets from 2016 where he ran away with a 30.3 percent target market share. Given the scarcity of every-down running backs, McKinnon’s projected touches and potential upside gives him the edge over Evans. I’m puzzled that this needs to be stated, but current Fantasy Football Calculator ADP has Bernard being drafted after Blount in PPR leagues. The upside with Bernard cannot be overstated if Joe Mixon were to miss anytime. We saw last year that when Mixon was banged up in Weeks 13-17, Bernard’s snaps, touches, and fantasy value all skyrocketed. He ended up being the fantasy RB9 during this five-game stretch, despite only hitting pay dirt twice during that span. The Bengals reinvested in their offensive line this offseason, adding tackle Cordy Glenn and first-round center Billy Price. Mixon isn’t going anywhere, but Bernard shouldn’t be overlooked to this degree. He has standalone value as a flex-worthy option during bye weeks with the potential for much, much more if Mixon were to miss any time. While the Bengals project for a battle between two running backs, the Lions offense suddenly has an abundance of backs now with differing roles. Second-round rookie Kerryon Johnson appears locked in for touches between the 20s. Theo Riddick will come in on obvious passing situations. Blount should retain his career role of a short-yardage specialist and goal-line back. Blount’s weekly variance will make him a difficult play in traditional redraft leagues. The Lions have historically been one of the most pass-happy teams in the league, ranking top-three in pass play percentage each of the past three years. Their red-zone usage also seems to reflect that, with them ranking top-six in pass plays called there despite rostering bruisers in Zach Zenner and Dwayne Washington (both 220-plus pounds). 31-year-old Blount could change that philosophy, but he’d still remain a touchdown-or-bust fantasy candidate. With the Lions making the aggressive move of trading up for Johnson, it wouldn’t be that surprising to see him garner more playing time as the season wore on and limit Blount’s opportunities. Given their similar price tags at this point, Bernard is the much safer fantasy pick with his reception upside (Blount offers a near-zero there) and zero-RB homerun potential. The Round 12-13 turn is where we’re looking for potential upside and home run picks. Everything is lining up for Stills to be this year’s top breakout candidate. His team has the second-most available targets (290) in the league. He’s on a pass-happy team (led NFL in pass play percentage last year) that should be facing a ton of negative gamescript (projected by Bovada for just six wins). Miami has the softest opening schedule against pass defenses Weeks 1-12, according to Warren Sharp, and Stills should face mostly No. 2 corners with DeVante Parker drawing their opponent’s top cover man. Add it up and the Stills’ connection has the potential for him to far exceed his current ADP at the Round 11-12 turn. If opting for a later dart throw at the tight end position, Njoku makes for a highly-intriguing one entering 2018. In Buffalo, Tyrod Taylor’s most-targeted weapon was Charles Clay. He relied on the short-yardage checkdown option heavily and it shouldn’t surprise anyone if that tendency transferred with him to his new team. Baker Mayfield was our most accurate quarterback charted and should have little difficulty with the underneath throws in his graduation to the NFL. Njoku will likely suffer with week-to-week consistency given the plethora of short-target weapons Cleveland has, but that’s already baked into his ADP and can be said for most of the other tight ends being drafted around him. He’s still on an ascending offense that should see far superior quarterback play than he did in 2017. Unfortunately for Doctson supporters, it will likely be Jamison Crowder who benefits the most from the change in quarterback. Over the past five years, Alex Smith has thrown the ninth-most completions to slot receivers, averaging a 102.8 passer rating (third-best among qualified players). Despite leading the team in routes run last year, Doctson’s 78 targets from last season (16 games played) doesn’t have quite enough volume to warrant dart throw consideration in the middle to late rounds. He’s best left for others to chase given the other quality receivers being drafted around him. Eifert has played less than 50 percent of his possible career games (39 of 80). The one-time prolific touchdown scorer cannot be relied on to stay healthy as he’s already missed time in both OTAs and the team’s first mandatory minicamp. Let others try to invest in the headache of Doctson and Eifert and opt for the potential league-winning tandem of Stills and Njoku instead. While the Bears are drawing the eyes of many as this year’s breakout team, one team quietly sneaking under the radar that’s littered with value plays up and down the board is the Tennessee Titans. While I’m happy to take any of the pieces in this offense, the best bang for your buck has to be signal-caller Mariota. The Titans will be shifting to former Rams OC Matt LaFleur’s offense this year in what should be a bounceback campaign for Mariota. Mariota had the highest differential between his PFF adjusted passer rating and traditional passer rating, signaling potential growth if the weapons around him can capitalize on his “big-time throws.” Mariota is also primed for a bump in positive regression with his touchdown percentage, which was over 5.0 percent each of his first two years before dipping to 2.9 percent in Year 3. Add in his rushing upside (five rushing touchdowns last year), and Mariota is arguably one of this year’s best quarterback sleepers. While the Titans offense appears to be on the upswing, the Raider’s outlook is less rosy. Head coach Jon Gruden appears to be assembling an Expendables-esque roster with over-the-top aged veterans re-structuring Marshawn Lynch’s contract and adding Jordy Nelson and Doug Martin. Throw in a provocative desire to “throw the game back to 1998” and the final outlook doesn’t look too promising for this offense — particularly fifth-year quarterback Carr. He’s coming off a poor year where his numbers took a step back across the board last season. Gruden’s offense may not help Carr get back on track right away, as he works on implementing his West Coast offense and lowers the number of snaps from shotgun for Carr. That could be potentially detrimental to Carr’s growth. Last year, Carr had an 88.3 passer rating under shotgun compared to 72.5 under center, according to SharpFootballStats. Carr also struggled immensely against pressure, throwing just a 40.8 adjusted passer rating (26th out of 29 qualifiers). 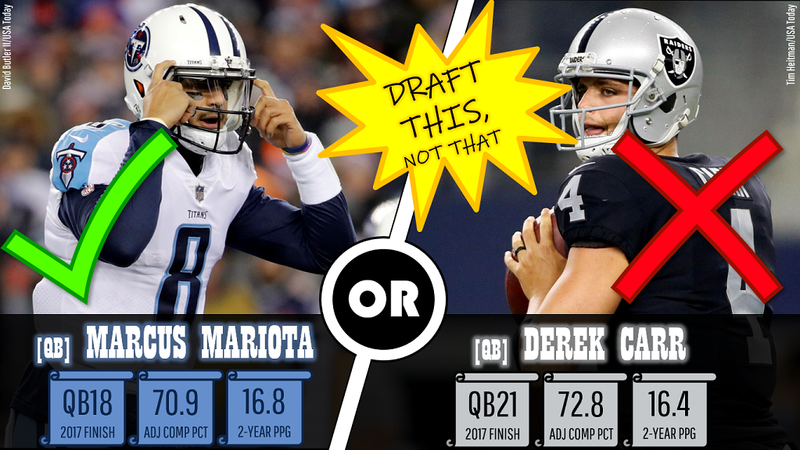 In what should be a run-heavy, West Coast offense, Carr is a player worth fading in favor of Mariota and the rising Titans offense.